Just like "curb appeal", ham glaze recipes makes the first impressions of your main dish a winner when entertaining family and friends. These recipes help your smoked ham or pork roast not only come to the table looking spectacular but tasting every bit as good. Any pork recipe will benefit, whether cooking pork tenderloin, making a smoked ham recipe or even a Sunday pork loin roast recipe, these glaze recipes will not let you down. to this beautiful finish you'd be proud to serve your family. to this succulent, sweet & sticky masterpiece. These different glaze and basting sauces give any pork recipes a beautiful finish coating that tastes just a great as they look. This Honey Dijon mustard based recipe is absolutely perfect on a hickory smoked ham recipe like the one in the pictures above. 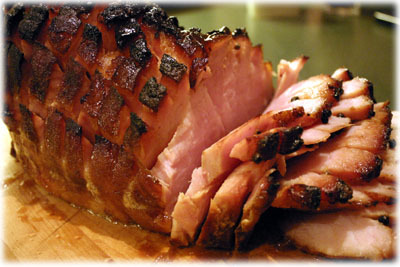 Simple and quick to make when basted on the ham it caramelizes to a sticky sweet crusty coating. When mixed well, pour 1/2 of the sauce over the smoked ham recipe before you cook it and reserve the rest of the ham glaze to baste with when cooking the ham. This one is slightly more work then the one above but gives beautiful results when used on a pork roast like the one in the pictures above. 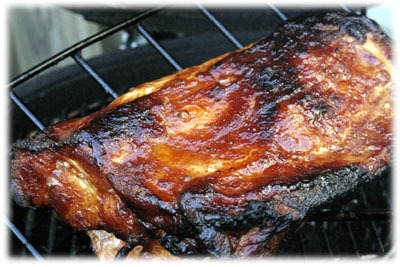 Just the right combination of ingredients give a neutral meat like pork loin a burst of flavor. 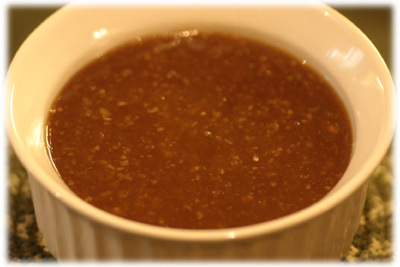 Add the first 3 ingredients of the Maple Mustard Glaze (oil, onion and garlic) in a food processor or blender and process until finely pureed. 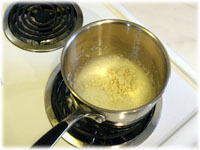 Place the puree onion/garlic in a medium sauce pan. 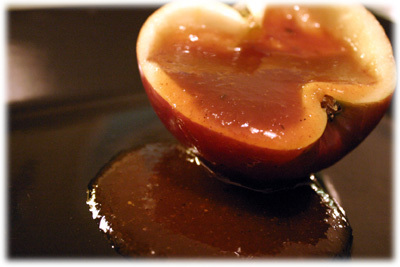 Combine the remaining 8 ingredients of the glaze to the saucepan with the pureed onion/garlic and stir well to combine. 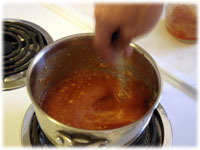 Bring just to a boil then reduce heat and simmer until the glazing sauce thickens. 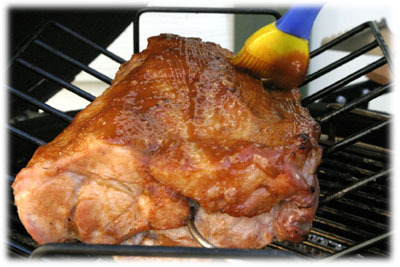 Baste the pork roast with this several times as it cooks to build up a nice thick coating. 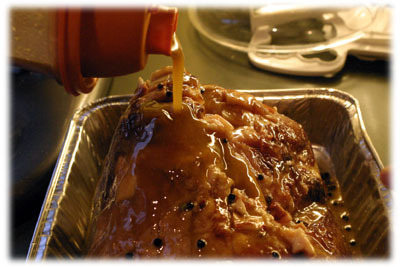 Reserve some of the sauce if you want to drizzle over the sliced roast after its cooked.